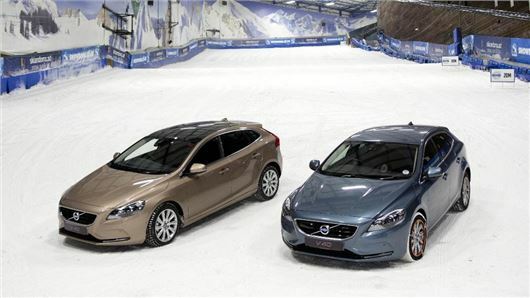 Volvo has taken to an indoor ski slope to demonstrate the benefits of using cold weather tyres. Typically designed for all conditions below 7 degrees Celsius, cold weather tyres are made of a different tyre compound to improve traction in low temperatures, regardless of the weather. Perhaps more importantly they’re designed to offer better traction in wet, icy or snowy conditions, thanks to sipes. These little ‘cuts’ of extra tread improve traction on snow and ice. To demonstrate the benefits of winter tyres Volvo fitted one front-wheel drive V40 with them and left another on summer tyres, then drove them in turn up a snow covered ski-slope. The car on summer tyres barely made it past the five metre mark while the car on winter tyres made it right to the top. Volvo also showed how beneficial snow socks, can be as a temporary solution. Volvo sells both winter tyres and snows socks at its dealerships. The video below shows the demonstration in more depth. Why don't they show the car that could not get up? I would guess 90,000 but you are do by age of the car. It's not like those older Nissans the sold zautos.com/used-car/for... with a chain. On my car I could just remove the valve cover and see the top of the belt. Hit the starter and see some more till I decided I didn't need a new belt. Everything you wanted to see there APART from what you actually wanted to see!! Where's the back to back test? If we could all afford 2 sets of tyres then fine. When car manufactures deliberately flog cars with summer tyres in the hope that you'll buy their winter versions then I think its a bit cynical. I had this very problem with a new Volvo XC60. First drop of cold rain on an autumn morning I found myself sliding down a hill, and only just managed to stop the car. Changed the tyres for all weather - so much better. Next time I shall insist on what I want. So where was the actually footage demonstrating?? ?